City Tech (New York City College of Technology), of The City University of New York (CUNY), is the largest four-year public college of technology in the Northeast and a national model for technological education. City Tech has an enrollment of more than 17,000 students in 29 baccalaureate and 27 associate degree programs. City Tech is located at Metrotech Center in downtown Brooklyn's "Tech Triangle," home to hundreds of innovation firms. City Tech students were awarded $74 million in grants-in-aid and 85% of new students received financial aid. City Tech tuition and fees cost less than half of the national average for public colleges and universities. The mission of the Office of Admissions is to recruit, admit, and serve an eligible and diverse urban population. Through multiple admission and recruitment strategies, the Office of Admissions works to ensure that eligible students have access to a high quality technological and professional education. City Tech prides itself on making a difference in our student's lives. Students seeking admission into City Tech can start the on-the-spot admission process after April 11th for the summer and fall semesters and after November 7th for the winter and spring semesters. Effective fall 1995, if you are 60 years of age or older and meet the CUNY requirements for demonstrating New York state residency, you may audit courses tuition-free on a space-available basis. As an auditor, you will receive neither grades nor academic credit. Upon registration, you must pay a $65 fee plus applicable student fee at the office of the Bursar. If you wish to receive academic credit, you must pay the appropriate tuition for the courses. In either case, you must apply according to the procedures outlined above. You must provide proof of age, i.e., birth certificate, driver's license or Medicare card to the Office of Admissions prior to registration. Visiting the campus is a great way to learn about the college and all that we have to offer. 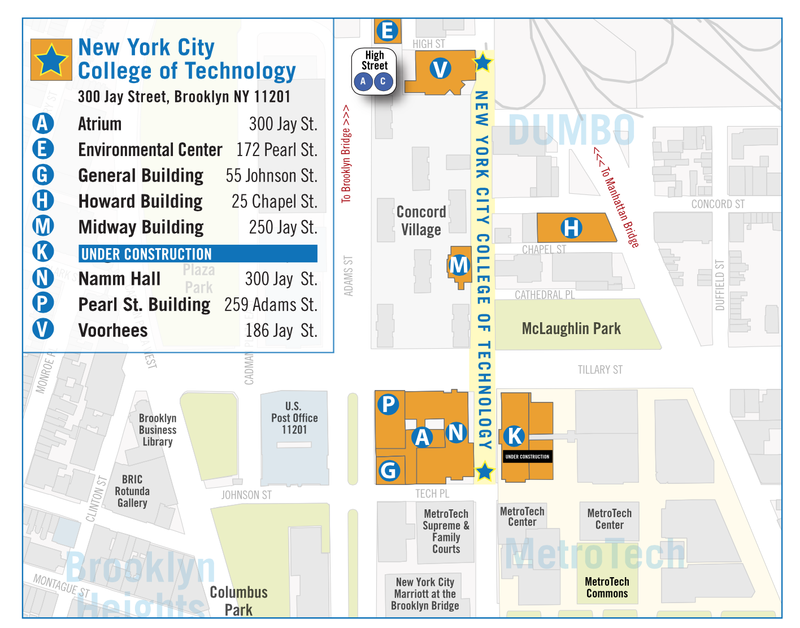 City Tech is located at the foot of the Brooklyn Bridge, adjacent to the Metro Tech Center academic and commercial complex. The campus is a two-minute walk from bus and subway lines serving the Downtown Brooklyn area. Our campus tour and information session will provide you with information about our admissions requirements, academic programs, support services, and facilities. Our campus tours are typically 60- to 90-minutes long and begin with a brief information session. Reservations are required and can be made by clicking on one of the registration links below. After you apply, find out what is required to complete your admission review and how to check your application status. Now that you have completed the Online Admission Application be sure to submit all required supporting documents, and review notification dates and the type of admission decision you should expect to receive. Please remember that it is your responsibility to check your application status to ensure that we have received all documents. You should allow 6-8 weeks for the status of your application to be updated. Please note that all materials and documents (including original documents) submitted as part of an application for admission become the property of CUNY/UAPC and cannot be returned. College isn't free. Scholarships and financial aid can help. City Tech offers 51 degree programs in the technologies of art and design, business, computer systems, engineering, entertainment, health care, hospitality, human services, the law-related professions, career and technology teacher education, and the liberal arts and sciences. City Tech works with its partners to support the evolution of Brooklyn's Tech Triangle and the economic expansion of Downtown Brooklyn. Through City Tech's partners, students have the opportunity to intern at companies that operate in the Brooklyn Navy Yard, as well as at Goldman Sachs, Brookhaven National Laboratories and many other leading corporations. Make Sure to Check Off Each Task Below. Take the CUNY Assessment Exam. If you do not have an appointment or missed your scheduled date please call the Office of Academic Testing at 718-260-5171. You will receive your registration appointment once you have completed the exam. Students who have attended a foreign high school are required to take the Ability to Benefit test. Please call the Office of Academic Testing to schedule an appointment. If City Tech was not your first choice college and you took the Placement Test at another CUNY school, visit the Admissions Office, Room NG-17, to guarantee your spot at City Tech. You will not be able to register for classes if you do not do this! Students in need of reasonable accomodation should call the Center for Student Accessibility at 718-260-5143 for more information or to set up an intake appointment. Submit proof of your immunization to the Admissions Office. Forms can be picked up in Room NG-17 or you can download here. Submit the paperwork necessary to receive in-state tuition, if requested. The Last day you can submit your proof for the Fall 2016 semester is December 21, 2016. Apply for financial aid. Go to www.fafsa.gov to apply now! Apply for scholarships or grants, if eligible. If you have completed everything on the check list, Great! You are now ready to begin classes at City Tech. Classes begin for the Fall Term on August 25, 2016. Good luck and we wish you a wonderful semester! High school diploma with minimum of a 70 average or a minimum score of 2700 on the High School Equivalency (GED), TASC, HSET exam. High school diploma with a 75 or higher average or a minimum score of 2750 on the High School Equivalency (GED), TASC, HSET exam. Some high demand and select programs require an 80 or higher average and may have specific admission criteria. Please contact us for additional information on the major to which you wish to apply. Proficiency in English and Math: Students who have minimum scores of 480 (Verbal) / 530 (Math) in SAT; or 20 (English) / 21 (Math) in ACT; or 75 (English regents/ 75 or higher in the Seq 2 or 3 Math regents, OR Math A or B regents with a 75 or above OR Integrated Algebra, Geometry or Algebra 2/Trigonometry regents with and 80 or above OR Common Core Math Regents in Algebra 1 or Geometry regents with a 70 or above or the Common Core Algebra2/Trigonometry regent with a 65 or above are exempted from the CUNY Assessment Test when they are accepted to the college. Students will still need to take the Math exam for placement purposes. A grade of a C or better in non — remedial courses from an accredited college or university or from appropriate test scores from the SAT, ACT, NYS Regents, or CUNY Proficiency Examinations. Students who do not intend to qualify for a degree but wish to take credit-bearing courses may apply for non- degree status. Students visiting from non-CUNY colleges must apply as non-degree students. Students applying for this status must submit an original high school diploma or General Education Diploma (G.E.D.) with scores and proof of CUNY certification in reading, writing and mathematics. Those students who have attended a CUNY college must submit an unofficial transcript (student copy) of all colleges attended or original baccalaureate degree; students must be in good academic standing. Students on permit or visiting from non-CUNY colleges (State University, private or out-of-state) must also provide the Office of Admissions with written permission from their school (registrar or dean) on official school letterhead to take courses at City Tech. The letter or form must state that the student is currently enrolled and is in good academic standing at his/her institution. It should also list the courses desired. Complete the application form and attach the permission letter/form along with the unofficial transcript (student copy) to the application. NON-DEGREE STATUS IS GOOD FOR ONE SEMESTER ONLY. It is intended for personal enrichment and should not be used to circumvent the formal admissions requirements of the college. Non-U.S. citizens: Students who are not U.S. citizens may be required to provide proof of immigration status and/or proof of NYS residency in order to be considered for New York State resident tuition rates. This also applies to students attending out-of-state colleges. Acceptance into the college does not guarantee that course(s) you desire will be available. For further information or assistance, call (718) 260-5500. 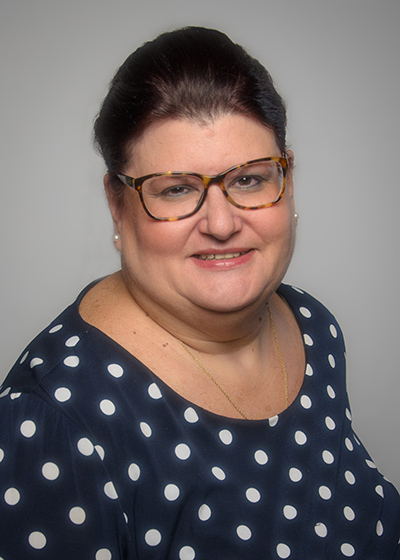 Hello my name is Alexis Chaconis, the Director of Admission Services here at City Tech. I am delighted that you are exploring our website. City Tech is an exceptional College that goes beyond traditional class offerings to create a high-tech, hands-on educational experience for its students. Throughout this website you will find answers to a number of your questions along with the names of individuals glad to help you if you need additional information. CUNY alumnus, I can tell you first hand of the wonderful faculty and caring service providers at our College. City Tech is and always will be a college of opportunity for all its students. So please explore our website, contact our Admission Office or schedule a tour. We look forward to hearing from you.